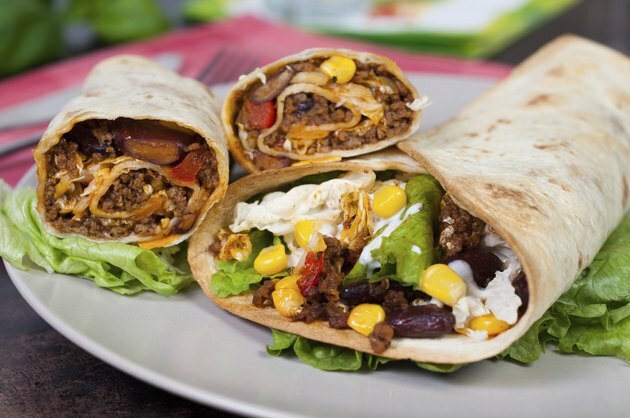 Frozen burritos are a versatile food that satisfy your appetite in a hurry. Most frozen burrito packages have instructions for both microwaving and baking in conventional ovens. Microwaving a burrito results in a softer tortilla, while cooking in the oven gives a crispier shell. There is no need to thaw frozen burritos before baking them. To dress up frozen burritos, try baking them in a pan with enchilada sauce, salsa, cheese, sour cream and fresh chopped vegetables. Remove the plastic wrapper from the frozen burrito. Wrap the burrito in a single layer of aluminum foil. Place the burrito on a cookie sheet and slide it onto the top rack of your oven. Bake the burrito for 35 to 40 minutes. Remove the foil and place the burrito back on the cookie sheet. Return the burrito to the oven for an additional 5 to 10 minutes, or until the tortilla is as crispy as you want it. How Many Calories in a Bean & Cheese Burrito?